Sweet chestnut (not to be confused with horse chestnut) grows widely across Britain and the rest of Europe and offers an attractive alternative to oak. Despite its availability, British sweet chestnut historically has not been widely used domestically due to the English love of oak. 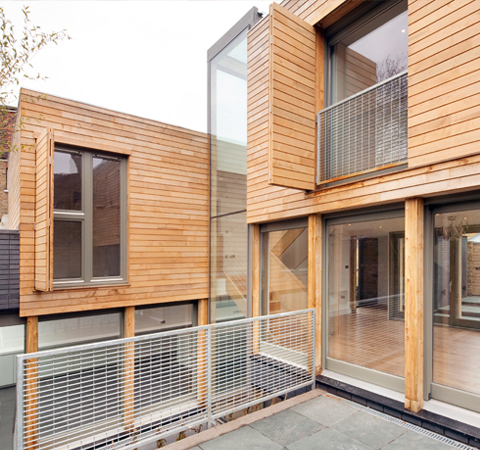 However, a number of key projects including some supplied by Vastern Timber have persuaded architects and designers that British sweet chestnut is a functional, beautiful and environmentally sensitive choice. 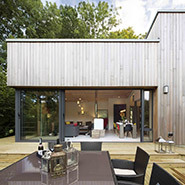 British sweet chestnut cladding is hard-wearing, strong and durable, and relatively light when compared to other hardwood cladding, making it ideal for exterior use. Additionally, sweet chestnut is known to be a very stable timber, resulting in less movement, distortion or splitting. It has a similar golden colour to oak, but with stronger grain and occasional dark brown mineral streaks and will weather to a natural silver colouring if left untreated. 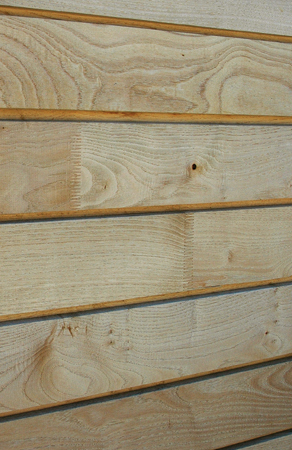 Sweet chestnut cladding is produced as finger-jointed boards supplied in 4.0mt lengths which are created by mechanically bonding a number of shorter lengths together in a high pressure press using moisture resistant glue. This process is a big step forward in improving both the performance and the environmental credentials of our British sweet chestnut cladding. By utilising shorter lengths of sweet chestnut we can increase the yield, and therefore the value, of the forest resource and reduce the waste in our sawmills, all of which is good news. Furthermore, finger-jointed boards are longer, less prone to distortion and of a better and more consistent quality than standard boards. 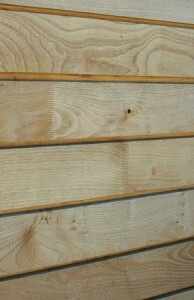 One feature of sweet chestnut cladding that must be considered is the high tannin content. During the first few months after the cladding has been attached, tannin will exude from the boards, resulting in streaks and stains where it comes in to contact with masonry or render . Tannin also corrodes ferrous metal, so it is therefore important to use either stainless steel fixings. Additionally care should be taken to keep other ferrous metal such as scaffolding away from the cladding to avoid staining of the boards. Appearance Newly machined boards will be a relatively consistent light straw colour (More consistent in colour than oak). Some pieces may include brown mineral colouring. Being jointed from shorter lengths, the colour variation will be more exaggerated and the zigzag joints will be noticeable. As the boards weather, the colour variation will even out and will change to a silver-grey patina. Weathering As the boards weather the colour will change to a silver-grey. On shaded elevations or in areas of higher pollution the oak may weather to more of a black colouring. In semi-shaded areas such as under eaves, the exuding tannin may leave unsightly stains. Lengths Jointed at either 4.0mt or 6.0mt allowing for a small % of cutbacks. Resistance to fixing Medium. Pre-drilling recommended. When to fix Ideally Autumn / winter. Avoid hottest months. Appearance Newly machined boards will be a relatively consistent light straw colour. As the boards weather, the colour will change to a silver-grey patina. Working properties Average workability (Easier than oak). Takes fixings satisfactorily. Extractives Like oak, sweet chestnut contains tannic acid, which will corrode ferrous metals. When the two come into contact, a blue sludge is formed that will stain the wood and anything else it meets. All fixings used in conjunction with sweet chestnut should be stainless steel. Tannic acid could also leave unsightly brown stains on the surface of the cladding and will stain any porous materials below the cladding. 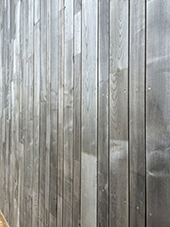 The reactivity of tannin makes sweet chestnut cladding unsuitable for polluted areas and shaded areas. Fire treatment Impregnation not possible.